The Christmas Island Frigatebird is a 90-100 cm black bird with a forked tail. It is also known as the Andrew's Frigatebird. It is a critically endangered bird (IUCN Red List). It only breeds in Christmas Island in Australia. According to a study made in 2003, there were only 1,171 breeding pairs. Breeding and non-breeding birds have been recorded over the Sunda Shelf, South China Sea, the Andaman Sea, the Sulu Sea, off south-wet Sulawesi and in the Gulf of Thailand. When not breeding, they range across Southeast Asia to Indochina and south to northern Australia. Frigatebirds have a very distinctive profile. They are big, black, and have angular pointed wings and long bills with a hook at the end. 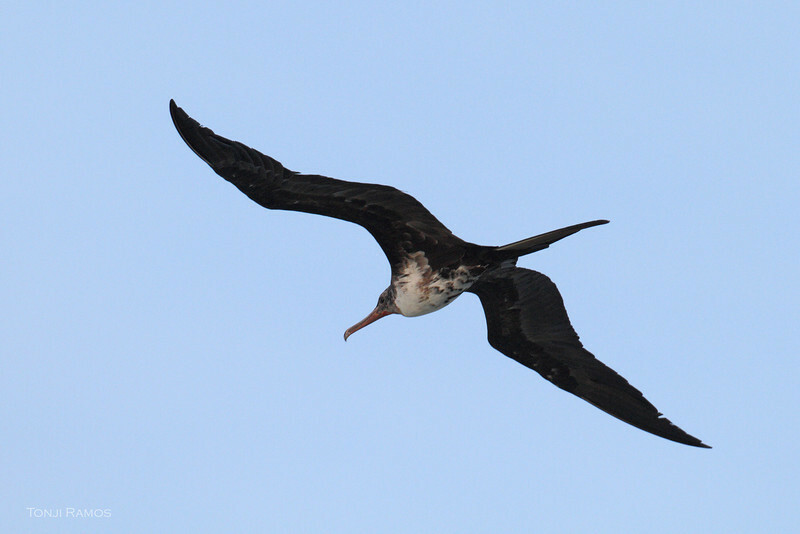 However, identifying them to the species level is notoriously difficult because each species of frigatebird has 9 possible color and pattern permutations as it ages: adult male, adult female, juvenile, 2nd year female, 2nd year male, 3rd year female, 3rd year male, 4th year female, and 4th year male. Then, if you are in Asia you add the possibility of seeing 3 of the 5 species of frigatebirds in the world. So, If you are in the Sulu Sea and you see a frigatebird that you want to identify, you might get very confused. Best to take a picture! The adult male Christmas Island Frigatebird has a black head, white egg-shaped belly, black throat and breast. It has a shaggy crest that is visible when it is perched. The adult female has a black head, white convex belly, white breast, black throat, clean white collar that makes the head look "hooded", white lower neck, black tabs and a very long and pink bill. It also has an orange gular sac (inflatable sac on the throat area). Thank you to David James for confirming the ids and correcting the ages of the birds. CHRISTMAS ISLAND FRIGATEBIRD, 3rd year female Fregata andrewsi Tubbataha Reef, Sulu Sea, Philippines We thought this was a 4th year female, but David James said, "3rd year female because pink bill and red orbital ring; black-belly mottling is odd"